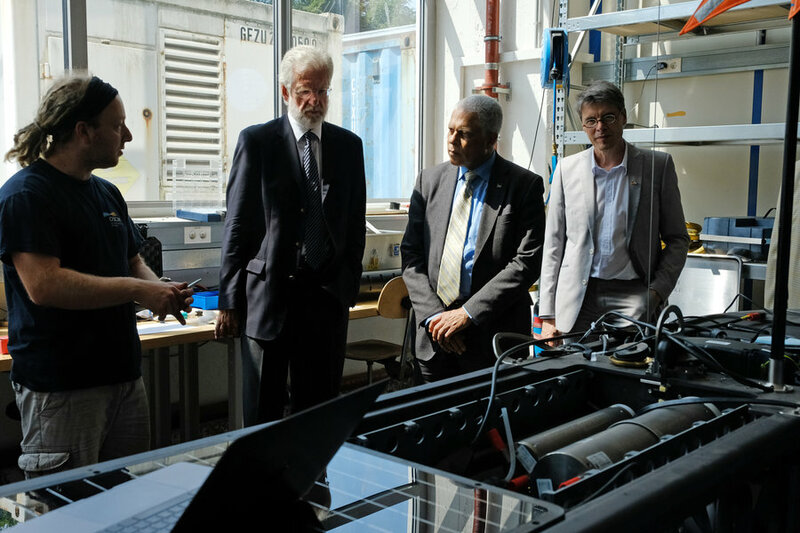 Today, as part of an official trip to Germany, his Excellency Dr. José da Silva Gonçalves, both Minister of Tourism and Transport and Minister of Maritime Economy of the Republic of Cabo Verde, visited the GEOMAR Helmholtz Centre for Ocean Research Kiel. Here, the Minister spoke with GEOMAR Director Prof. Dr. Peter Herzig about the existing close partnership between Kiel Marine Sciences and Cabo Verde as well as about further fields for future cooperation. During a visit to GEOMAR's Technology and Logistics Centre, the Minister learned about the latest methods and equipment used in ocean research. For more than fourteen years, researchers from Kiel have been working closely with colleagues from Cabo Verde, particularly with researchers at the Cape Verdean fisheries research institute INDP in Mindelo on the island of São Vicente. In November 2017, GEOMAR and INDP were able to inaugurate the new Ocean Science Centre Mindelo as a hub for international research groups working in the tropical Atlantic. “The region is highly interesting for many questions addressed today in ocean, climate and atmospheric research. The OSCM will facilitate field campaigns in the region and logistics for storing and maintaining scientific equipment. Without the close partnership with our colleagues from Cabo Verde, all these activities would not be possible”, emphasizes marine chemist Prof. Dr. Arne Körtzinger, who is responsible for the cooperation with Cabo Verde at GEOMAR. “Therefore, we were all very pleased about today's visit, which we consider another sign of the close ties between Cabo Verde and us,” adds GEOMAR Director Professor Herzig.